Severus Snape is a fictional character in J. K. Rowling's Harry Potter series. He is an exceptionally skilful wizard whose coldly sarcastic and controlled exterior conceals deep emotions and anguish. A Professor at Hogwarts School of Witchcraft and Wizardry, Snape is hostile to Harry due to his resemblance to his father James, who bullied Snape during their time at Hogwarts. Snape's character becomes more layered and enigmatic as the series progresses, and a central mystery concerns his loyalties. Snape dies at the hands of Lord Voldemort in the seventh book, at which time his back story is revealed. Though attracted to the Dark Arts and Voldemort's ideology of wizard supremacy, Snape's love for Muggle-born Lily Evans, Harry's mother, eventually compelled him to defect from the Death Eaters and become a double agent for Albus Dumbledore and the Order of the Phoenix. The character has been widely acclaimed by readers and critics. Rowling described him as "a gift of a character" whose story she had known since the first book, and Elizabeth Hand of The Washington Post opined that Snape's life "is the most heartbreaking, surprising and satisfying of all of Rowling's achievements". Actor Alan Rickman portrayed Snape in all eight Harry Potter films, released between 2001 and 2011. In an interview, Rowling described Snape's character as an "antihero". She has said that she drew inspiration for Snape's character from a disliked teacher from her own childhood, and described Snape as a horrible teacher, saying the "worst, shabbiest thing you can do as a teacher is to bully students." However, she does suggest in the books that he is generally an effective teacher. Although Rowling has said that Gilderoy Lockhart is her only character that she "deliberately based on a real person", Snape was reportedly based, at least in part, on John Nettleship, who taught Rowling chemistry and employed her mother as an assistant at Wyedean School near Chepstow. For Snape's surname, Rowling borrowed the name of the village of Snape, Suffolk. In a 1999 interview and again in 2004, Rowling singled out Snape as one of her favourite characters to write. Rowling was less forthcoming about Snape than she was for other characters, because his true loyalties and motivations were not revealed until the final book. However, she hinted numerous times at Snape's important role, suggesting that people should "keep their eye on Snape". In 1999, answering a question regarding Snape's love life and the redemptive pattern to his character, Rowling expressed her surprise at the foresight. Rowling also disclosed that after the publication of Prisoner of Azkaban, there was one female fan who guessed Snape loved Lily Potter, making Rowling wonder how she had given herself away. After the completion of the series, Rowling began to speak openly about Snape, discussing the contrast between his character arc and that of Albus Dumbledore. Rowling said "the series is built around [the Dumbledore and Snape storylines]", and maintained that she always knew what Snape would turn out to be at the end and that she carefully plotted his storyline throughout the series. "I had to drop clues all the way through because as you know in the seventh book when you have the revelation scene where everything shifts and you realise...what Snape's motivation was. I had to plot that through the books because at the point where you see what was really going on, it would have been an absolute cheat on the reader at that point just to show a bunch of stuff you've never seen before." Rowling further said in an interview that she wanted Snape to find redemption and forgiveness: "Snape is a complicated man...he was a flawed human being, like all of us. Harry forgives him...Harry really sees the good in Snape ultimately... I wanted there to be redemption." Snape first appears in Harry Potter and the Philosopher's Stone, shortly after Harry arrives at Hogwarts. He is the school's Potions Master, though he is widely rumoured to covet the Defence Against the Dark Arts post. Snape himself confirms the rumour in Harry Potter and the Order of the Phoenix. Snape is a sinister and malicious teacher who makes frequent snide and disparaging remarks at Harry's expense. He quickly becomes the primary antagonist of the book, as Harry suspects him of plotting to steal the philosopher's stone, and of attempting to kill him. Only the climax of the book reveals that Professor Quirrell, in league with Lord Voldemort, is the real enemy; Snape, suspicious of Quirrell, had been looking out for Harry throughout the book. In the final chapter, Dumbledore suggests that because Harry's father James had saved Snape's life when they were both students, even though the two detested each other, Snape felt responsible for Harry in return. As the final book reveals, this is not the full story. In any case, even after Quirrell's true role is revealed, Harry retains feelings of suspicion and resentment towards Snape, and their relationship remains tense. Snape's behaviour and attitude towards Harry also remain unchanged. Snape has a minor role in Harry Potter and the Chamber of Secrets, where he helps Gilderoy Lockhart oversee Hogwarts' short-lived Duelling Club, but he has little interaction with the main plot. It is while attending the Duelling Club that Harry learns the Expelliarmus spell, which plays a significant role in later books, by seeing Snape use it. In Harry Potter and the Prisoner of Azkaban, Snape demonstrates his expertise with potions by brewing the complex Wolfsbane potion for the new Defence Against the Dark Arts professor, Remus Lupin. Throughout the third book, Snape suspects that Lupin may be helping Harry's godfather Sirius Black enter Hogwarts castle; Sirius had been convicted (wrongly, as it is later revealed) of murdering Peter Pettigrew and innocent bystanders, and betraying the Potter family's hiding place to Voldemort. This suspicion stems from Lupin's friendship with Sirius and Harry's father, James, while they were all at Hogwarts as students. Near the climax of the book, Snape attempts to apprehend Sirius, but Sirius escapes with Harry's aid. Snape informs Dumbledore of this circumstance, and when Harry and Lupin are not punished, Snape retaliates by revealing to the entire school that Lupin is a werewolf, forcing the latter to resign his post. Prisoner of Azkaban reveals more details about the connection between Snape and James. While in school together, Sirius once tricked Snape into almost entering the Shrieking Shack while Lupin was there, transformed into a werewolf. James realised the danger and stopped Snape, saving his life; this is the incident Dumbledore referred to at the end of the first book. Snape, however, believes James' actions were self-serving, to avoid being expelled. Snape's role in the fourth novel, Harry Potter and the Goblet of Fire, is not substantially different from that of the previous three books. He is apoplectic when Harry is unexpectedly entered into the Triwizard Tournament. Later Harry accidentally falls into Dumbledore's Pensieve and views memories of several Death Eater trials from years before. At one point, Snape is named as a Death Eater by Igor Karkaroff, but Dumbledore comes to Snape's defence, claiming that although Snape had indeed been a Death Eater, he changed sides before Voldemort's downfall and turned spy against him. Later, Dumbledore assures Harry that Snape's reformation is genuine, though he refuses to tell Harry how he knows this, saying the information "is a matter between Professor Snape and myself". Later in the book, Dumbledore has Snape teach Harry Occlumency, the protection of the mind from outside intrusion or influence. The sessions are made difficult by their mutual hostility and end prematurely when Harry uses Dumbledore's Pensieve to view one of Snape's worst childhood memories without the latter's permission. He sees the memory of Snape being bullied by James and Sirius, and of calling Harry's mother Lily a Mudblood (a highly offensive term). Only in the final book is it revealed that, prior to this confrontation, Snape and Lily had been close friends. Towards the end of the novel, Dolores Umbridge – the school's politically appointed headmistress – captures Harry and interrogates him about Dumbledore's whereabouts. She sends for Snape, demanding that he provide the magical truth serum Veritaserum in order to force Harry to reveal any information he may be hiding. Snape claims that his supplies of the serum have been exhausted after Umbridge tries to use the drug previously on Harry. It is later revealed that Snape had in fact supplied Umbridge with fake Veritaserum on the prior attempt. Snape then carries Harry's cryptic warning about Sirius' capture to the other Order members, allowing them to come to the rescue in the Department of Mysteries. Harry still holds Snape partly responsible for Sirius' death, believing Snape's goading spurred Sirius into joining the battle. In the second chapter of Harry Potter and the Half-Blood Prince, Bellatrix Lestrange and Narcissa Malfoy visit Snape at his home in Spinner's End. Narcissa's son Draco has been given a difficult task by Voldemort, and Narcissa swears Snape to an Unbreakable Vow that he will protect Draco, help him complete Voldemort's task, and finish the task himself if Draco fails. When questioned by Bellatrix about his loyalties, Snape says he has been working for Voldemort ever since Voldemort's return, and explains his actions in the previous books in that light. He points out that gaining Dumbledore's trust and protection has kept him out of Azkaban and free to operate on Voldemort's behalf. At the start-of-term feast at Hogwarts, Dumbledore announces Snape as the new Defence Against the Dark Arts professor. Horace Slughorn, a former teacher who himself had taught Snape during his Hogwarts years, comes out of retirement and replaces him as Potions Master. With Snape no longer teaching Potions, Harry enrolls in Slughorn's class and is lent an old textbook until his new one arrives. Harry finds marginalia, including a variety of hexes and jinxes seemingly invented by an unknown student, and substantial improvements to the book's standard potion-making instructions. The text is inscribed as being "the Property of the Half-Blood Prince". The notes greatly bolster Harry's performance in Potions, so much so that he impresses Slughorn. Snape, who maintains that he "never had the impression that [he] had been able to teach Potter anything at all", is suspicious of Harry's newfound Potions success. Before leaving Hogwarts to accompany Dumbledore in locating another horcrux – part of Voldemort's soul – Harry discovers from Professor Trelawney that it was Snape who overheard the prophecy and told it to Voldemort, resulting in Voldemort hunting down Harry and his parents. Despite this and Harry's angry questions, Dumbledore avers his trust in Snape. Returning to Hogwarts after retrieving Voldemort's Horcrux, Harry and Dumbledore alight atop the school's astronomy tower. Gravely weakened by the horcrux's protective potion, Dumbledore tells Harry he must fetch Snape, but before Harry can leave, Draco suddenly arrives, intending to carry out Voldemort's order to assassinate Dumbledore, closely followed by other Death Eaters (followers of Voldemort), and Snape. Snape interrupts the planned murder, killing the headmaster himself. Harry, who is paralysed under his invisibility cloak by Dumbledore for his own protection, witnesses the kill, and is released upon Dumbledore's death. Enraged, he pursues Snape, Draco, and the Death Eaters as they flee the castle. Snape easily blocks Harry's spells and jeeringly points out Harry's mistakes, but never strikes back. During the confrontation, Snape reveals himself as the eponymous "Half-Blood Prince" (being the half-blood son of Muggle Tobias Snape and pure-blood Eileen Prince). Snape passes through the school gates and Disapparates with Draco in tow at the book's end. The full relationship between Dumbledore and Snape and the reason for Snape's actions remain unknown until the final book. In an interview, Rowling mentioned that at this point in the series, the Harry–Snape relationship has become "as personal, if not more so, than Harry–Voldemort." Towards the end of the school year, Professors McGonagall, Flitwick, and Sprout force Snape to flee the school. Voldemort summons Snape to the Shrieking Shack. Erroneously believing Snape is the master of the Elder Wand and that Snape's death will make him the master of the Wand, Voldemort kills Snape by having his pet snake Nagini bite him through the neck. The dying Snape releases a cloud of memories and tells Harry, who has watched the entire scene from a hidden spot, to take and view them. The memories also show that as a Death Eater, Snape had revealed to Voldemort a prophecy made by Sybill Trelawney, causing Voldemort to attempt to prevent it by killing Harry and his parents. Snape, who had not realised until too late that the prophecy was referring to Lily and her family, asked Voldemort to spare Lily. Still in terror for her life, he also approached Dumbledore, admitted his actions, and begged him to protect the Potters. Dumbledore chided him for thinking only of himself and not of Lily's husband and child, but agreed and ensured that they were placed under the Fidelius Charm. In return, Snape secretly allied himself with Dumbledore and the Order of the Phoenix as a double agent against Voldemort, using his powers of Occlumency to hide his betrayal from Voldemort. However, Snape demanded of Dumbledore that his love for Lily (his reason for switching sides) be kept a secret, especially from Harry, because of the deep animosity he felt towards Harry's father and his mixed feelings towards Harry (who reminded him of both his love for Lily Potter and her death, and his animosity towards James Potter). Dumbledore agreed and kept the secret throughout his life, although questioning Snape's request to "never reveal the best of you". Even with his efforts to protect her, Snape felt responsible for Lily's death at Voldemort's hands. Snape's memories then reveal that Dumbledore had impetuously tried to use the Gaunt ring, which had been cursed by Voldemort, and had been suffering from a powerful curse. Snape's knowledge of the Dark Arts enabled him to slow the spread of the curse from Dumbledore's hand through his body, but he would have died within a year. Dumbledore, aware that Voldemort had ordered Draco to kill him, had asked Snape to kill him instead as a way of sparing the boy's soul and of preventing his own otherwise slow, painful death. Although Snape was reluctant, even asking about the impact of such an action on his own soul, Dumbledore implied that this kind of coup de grâce would not damage a human's soul in the same way murder would. Snape agreed to do as the Headmaster requested. Snape's memories also provide Harry with the information he needs to ensure Voldemort's final defeat, in the form of conversations Snape had with Dumbledore. In the epilogue to Deathly Hallows, set nineteen years after Harry defeats Voldemort, Harry has named his second-born son Albus Severus, after Albus Dumbledore and Severus Snape. As Albus is about to enter his first year at Hogwarts, he expresses concern that he will be sorted into Slytherin. Harry tells his son, "you were named for two headmasters of Hogwarts. One of them [Snape] was a Slytherin and he was probably the bravest man I ever knew." When Draco and Astoria Greengrass' son Scorpius Malfoy finds himself in an alternate timeline in which Voldemort won the Battle of Hogwarts, killed Harry and his allies and instituted a terrible reign of terror, he desperately searches for help in restoring history to its original course. He finds that in this reality Snape is still alive and still teaches at Hogwarts, and asks for his help. At first Snape is suspicious of him, since this timeline's version of Scorpius is a bully and a Voldemort stalwart. But when Scorpius shows that he knows of Snape having been in love with Lily, Harry's mother – Snape's most closely guarded secret – Snape becomes convinced that he does indeed come from a different timeline where Harry and his friends won. Snape then reveals that he, together with the fugitive Ron and Hermione Granger, maintain the last remnants of Dumbledore's Army – still waging hopeless resistance against the all-powerful Voldemort. In talking with Scorpius, Snape had learned that Harry would name his son "Albus Severus" and would regard Snape as "probably the bravest man I ever knew" – and is deeply moved. Though having guessed that in the other timeline he would die, Snape nevertheless willingly helps Scorpius recreate this timeline – and being discovered by Dementors, Snape sacrifices himself in order to cover Scorpius' escape. Rickman used this knowledge of Snape's ultimate loyalties throughout the films to decide how to play certain scenes, deliver specific lines, or use body language to convey specific emotions. When the directors of the films would ask him why he was doing a scene a certain way or delivering a line in a specific manner, Rickman would simply reply that he knew something they didn't. In Harry Potter and the Order of the Phoenix, the fifteen-year-old Snape (portrayed by Alec Hopkins) makes a brief appearance in a flashback to Snape's youth. In the final film, Harry Potter and the Deathly Hallows – Part 2, the younger Snape, perhaps ten or eleven, is played by Benedict Clarke. In 2016, a fan film prequel, Severus Snape and the Marauders, was released online and Snape was played by Mick Ignis. Before Alan Rickman was offered the role of Severus Snape, the role was originally offered to Tim Roth, who turned the role down in favour of portraying General Thade in Planet of the Apes. Snape is described as a thin man with sallow skin, a large, hooked nose, and yellow, uneven teeth. He has shoulder-length, greasy black hair which frames his face, and cold, black eyes. He wears black, flowing robes which give him the appearance of "an overgrown bat". The youthful Snape had a "stringy, pallid look", being "round-shouldered yet angular", having a "twitchy" walk "that recalled a spider" and "long oily hair that jumped about his face". In the chapter illustrations by Mary GrandPré in the American editions of The Prisoner of Azkaban, The Order of the Phoenix, and The Half-Blood Prince, Snape is depicted with a moustache and goatee, long black hair, and a receding hairline. Snape is generally depicted as being cold, calculating, precise, sarcastic, and bitter. He strongly dislikes Harry and often insults him by insulting his father James. As the series progresses, it is revealed that his treatment of Harry stems from Snape's bitter rivalry with James when they were in school together. In particular, James and Sirius bullied Snape, which according to Alan Rickman caused the already lonely boy to further "shut himself in". Rowling further described the young Snape as insecure and vulnerable: "Given his time over again [Snape] would not have become a Death Eater, but like many insecure, vulnerable people he craved membership of something big and powerful, something impressive.[...] [He] was so blinded by his attraction to the dark side he thought [Lily] would find him impressive if he became a real Death Eater." The adult Snape, on the other hand, is portrayed as very self-assured and confident of his abilities, to a degree that Rickman described as "full of himself." Director David Yates said Snape is a character with gravitas, authority and power. Snape typically displays a very calm and collected demeanour, rarely at a loss for words or taken off guard. His temper, however, is sometimes short where Harry is concerned and positively flares when dealing with his erstwhile tormentor Sirius, or when accused of cowardice. His otherwise impassive and aloof attitude seems to stem from his belief that people who cannot control their emotions are weak. Like some other prominent members of Slytherin house, Snape is shown to be a clever and cunning wizard. He is intelligent and has a keen, analytical mind. In an interview, Rowling adds that Snape is immensely brave, and when asked if she considers Snape a hero, replied: "Yes, I do; though a very flawed hero. An anti-hero, perhaps. He is not a particularly likeable man in many ways. He remains rather cruel, a bully, riddled with bitterness and insecurity—and yet he loved, and showed loyalty to that love and, ultimately, laid down his life because of it. That's pretty heroic!" All seven novels show Snape to be a very powerful wizard and to have been outstanding while a student. He specialises in potion making and has talent and passion for the Dark Arts. Sirius claimed that Snape knew more hexes and curses as a first-year student at Hogwarts than most seventh-years knew. Particularly gifted in potion making, Snape added major improvements to his Potions textbook while still a student. Also as a student, Snape shows a rare gift for discovering new spells. Lupin describes Sectumsempra as Snape's "speciality" in Deathly Hallows. Snape is shown using this spell as a teenager against Harry's father James and in the aerial battle in the last novel when he accidentally hits George Weasley (acting as a Potter decoy) with it while actually aiming for a Death Eater who was trying to attack Lupin, permanently severing George's right ear. Despite Sectumsempra's deadly power, Snape can also heal the wounds it causes. Snape is adept at reversing or containing potentially fatal damage from other dark curses as well, due to his vast knowledge of Dark Arts, as he does when Dumbledore and then Katie Bell are cursed. Skilful in the arts of Legilimency and especially Occlumency, Snape is able to both access the minds of others and protect his own thoughts—indeed, though Snape does not care for the term himself, Harry forms the uncomfortable impression early in the series that the Potions Master is able to "read minds." Being an Occlumens, Snape is able to keep his betrayal from Voldemort, who is himself described as being "the greatest Legilimens" in history. According to Rowling, Snape is the only Death Eater capable of producing a full Patronus, which, like Lily's, is a doe. Snape is a talented duellist, able to hold off by himself (if only briefly) a group of three Hogwarts professors that included former duelling champion Filius Flitwick. Professor McGonagall later implies that Snape learned to fly without the use of a broom, a rare skill previously displayed only by Voldemort. Snape's family background is mostly shown in flashbacks during the course of the last three novels. Snape was born to Eileen Prince, a witch, and Tobias Snape, a Muggle, making him a half-blood (hence the name, "Half-Blood Prince"). This is rare for a Death Eater, as remarked in the last book, though Voldemort himself also had a Muggle father. Snape spent his early childhood living with his parents in a small house in Spinner's End. Snape's family was a poor one and he is described as wearing ill-fitting clothes "that were so mis-matched that it looked deliberate". As a child, Snape was apparently neglected and his parents often fought with one another. Snape was very eager to leave his home to go to Hogwarts. Towards the end of the last novel, Harry draws parallels between his childhood, Snape's, and Voldemort's. Snape's true loyalty was one of the most significant questions in the series up until the end of the final instalment, Harry Potter and the Deathly Hallows. Although the first five novels depict him as unfair and vindictive towards Harry and his friends, he invariably ends up protecting or otherwise helping them when they or their allies are in danger. Several characters express doubts about his loyalty, but Dumbledore's trust in him is generally taken to be the final word. The sixth novel, Harry Potter and the Half-Blood Prince, departs from that model. In the second chapter, Snape claims to have been working for Voldemort ever since the latter's return, and only pretending to help Dumbledore. By killing Dumbledore toward the end of the novel, Snape seems to place himself firmly in Voldemort's camp. Rowling maintains this impression through the early chapters of the seventh novel. However, near the climax of the book, Snape leaves Harry his dying thoughts (to be viewed in the Pensieve) and ultimately reveals to Harry that he had been loyal to Albus Dumbledore throughout the series. Snape's fierce devotion to and love of his childhood friend Lily, Harry's mother, is the foundation of that loyalty. After Harry Potter and the Half-Blood Prince, Snape's loyalty was a matter of intense debate among the fans. The issue was given special attention in the marketing campaigns on behalf of the last book, Harry Potter and the Deathly Hallows. "Is Snape Good or Evil?" was one of the questions in Scholastic Inc.'s seven-question series, part of its marketing campaign for the book. As part of the Waldenbooks marketing campaign, two free stickers, one that said "Trust Snape" and another that stated "Snape Is A Very Bad Man" were available with the book. Borders Group published a separate book on the topic, The Great Snape Debate, containing essays and arguments from both sides of the debate. The secretive attitude and gradual unfolding of Snape's character was broadly admired, with Stephen Fry, the UK audio books narrator, saying in 2003: "Most characters like Snape are hard to love but there is a sort of ambiguity—you can't quite decide—something sad about him—lonely and it's fascinating when you think he's going to be the evil one..., then slowly you get this idea he's not so bad after all." David Yates, who directed the final four films of the series, also expressed his views on the character, saying: "A character like Snape, where you're not really sure if he's a good guy or a bad guy, that gives you a latent tension... I think the coolest thing you can do with an audience is deny them a little bit of information." Despite being less than kind, the character quickly gained popularity within fandom to a level that surprised Rowling herself. Joyce Millman suggests in her essay "To Sir with Love" in the book Mapping the World of Harry Potter, that Snape is derived from a tradition of Byronic heroes such as Wuthering Heights' Heathcliff. Jenny Sawyer from The Christian Science Monitor commented on the character's development in the series. She claimed that Snape is the only protagonist who genuinely has a choice to make and who struggles to do the right thing, hence the only one to face a "compelling inner crisis". She believed the popularity of the character is due to the moral journey and inner conflict that Snape undergoes within the series, as it is the hero's struggle and costly redemption that really matter: "[Snape's] character ached for resolution. And it is precisely this need for resolution—our desire to know the real Snape and to understand his choices—that makes him the most compelling character in the Potter epic." The final revelation of Snape's loyalty in Harry Potter and the Deathly Hallows was viewed positively by fans and critics alike. Daniel Radcliffe, who portrays Harry Potter in the movie series, expressed his delight, saying he was pleased to see that his theory that Snape would end up being a sort of tragic hero came through. Elizabeth Hand from The Washington Post wrote, "The much-maligned loner Snape does not come onstage until the latter part of "Deathly Hallows," but when he does the book becomes his: Snape's fate, more than Voldemort's, perhaps more even than Harry's, is the most heartbreaking, surprising and satisfying of all of Rowling's achievements." IGN listed Snape as their 4th top Harry Potter character, saying that he makes "quite an impact in the Harry Potter series", and IGN's Joe Utichi called Snape his favourite Harry Potter character and praised his character development. Shortly after the release of the final film, MTV held a public poll for fans to vote for the best character in the series, and Snape was voted #1. Around the same time, Empire magazine held a public poll for fans to vote for the 25 greatest characters in the series, and Snape once again came in at #1. In May 2011, Snape was again voted as the #1 favourite Harry Potter character in a public poll held by the Bloomsbury publishing house. In 2014, Watchmojo.com ranked him #1 on their "Top 10 Harry Potter Characters" list (beating Harry Potter; who is ranked #2) while they ranked him #3 on their "Top 10 Most Gut-Wrenching Harry Potter Deaths" list two years later. The character of Severus Snape has appeared in various animated parodies of Harry Potter. He is a starring character in Neil Cicierega's online Potter Puppet Pals parodies, and has a centric episode titled Bothering Snape. Also, the video The Mysterious Ticking Noise with the chorus "Snape, Snape, Severus Snape" was the winner for "Best Comedy" of the year 2007 at YouTube; it currently has over 170 million views. Snape is also parodied as Professor Santory Snapekin in Sluggy Freelance's webcomic entitled Torg Potter. In the first parody, Torg defeats a plot by Professor Snapekin to achieve ultimate power. In a 2004 sketch on Saturday Night Live in which Lindsay Lohan appears as Hermione Granger, Snape is portrayed by Will Forte. Snape has also been parodied in UK television. Comic Relief released a story called Harry Potter and the Secret Chamberpot of Azerbaijan, in which Snape is played by Jeremy Irons. Snape appeared in a Harry Potter parody named "Louis Potter and the Philosopher's Scone" in Alistair McGowan's Big Impression show, played by Alistair McGowan himself. In the Harry Bladder sketches in All That, Snape appears as Professor Chafe (portrayed by Jeremy Rowley), whose legs were badly chafed, causing him to be unnecessarily mean. Many sketches feature students brewing potions that did silly things, like enlarge students' behinds, give males large breasts, or change people into bras. In a sketch comedy named "Cooking With..." on Australian TV series The Wedge, Snape catches Harry and Hermione making love. 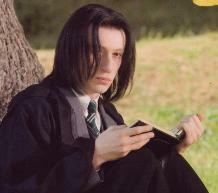 In A Very Potter Musical, Snape is played by actor Joe Moses. ^ "Rowling on Snape". half-bloodprince.org. Archived from the original on 26 July 2011. Retrieved 3 November 2012. ^ a b Elizabeth Hand (22 July 2007). "Harry's Final Fantasy: Last Time's the Charm". Washington Post. Retrieved 18 March 2008. ^ a b c d "Web Chat with J.K. Rowling 30 July 2007 on Bloomsbury.com" (PDF). Archived from the original (PDF) on 28 September 2007. Retrieved 2 October 2007. ^ a b "J.K. Rowling interview transcript". The Connection. WBUR Radio. 12 October 1999. Retrieved 14 March 2008. ^ "Barnes and Noble and Yahoo! chat with J.K. Rowling". barnesandnoble.com. 20 October 2000. Retrieved 15 September 2007. ^ Conversations with JK Rowling, p.21, quoted at JKR Quotes about Severus Snape: Accio Quote! ^ a b c "J.K. Rowling at the Edinburgh Book Festival". J.K.Rowling Official Site. 15 August 2004. Archived from the original on 21 July 2011. Retrieved 4 November 2012. ^ "Rowling's 'spell' on science teacher". BBC News. 28 December 2001. Retrieved 8 November 2012. ^ "The name's Snape, Severus Snape". This Is Gloucestershire. Northcliffe Media. 25 June 2009. Archived from the original on 1 January 2011. Retrieved 9 November 2012. ^ Hind, Lia (16 March 2011). "Chepstow inspiration for Harry Potter prof dies". South Wales Argus. Retrieved 9 November 2012. ^ "Rowling eToys Interview". 2000. Retrieved 16 July 2007. ^ Abel, Katy (1999). "Harry Potter Author Works Her Magic". Family Education. Pearson. Archived from the original on 18 July 2011. Retrieved 3 September 2007. ^ "World Book Day Chat". 4 March 2004. Retrieved 3 September 2007. I'm not going to tell you [what form Professor Snape's Boggart and Patronus will take], but that's because it would give so much away. ^ "Interview with Stephen Fry at Royal Albert Hall". 26 June 2003. Retrieved 3 September 2007. It is worth keeping an eye on old Severus definitely! ^ "J.K. Rowling interview transcript". The Connection. WBUR Radio. 12 October 1999. Retrieved 14 March 2008. I'm slightly stunned that you've said that...and you'll find out why I'm so stunned if you read book 7. ^ a b c "JKR: Snape and Dumbledore Two of the Most Important Characters in 'Deathly Hallows'". The Leaky Cauldron. 3 April 2008. Retrieved 7 April 2008. ^ Adler, Shawn (15 October 2007). "'Harry Potter' Author J.K. Rowling Meets With L.A. Students, Plots Her Next Move". MTV News. Retrieved 14 November 2012. ^ a b Vieira, Meredith (29 July 2007). "Harry Potter: The Final Chapter". Dateline. NBC. Retrieved 14 March 2008. ^ Melissa Anelli and Emerson Spartz (16 July 2005). "The Leaky Cauldron and MuggleNet interview Joanne Kathleen Rowling: Part One". The Leaky Cauldron. Retrieved 2 April 2008. ^ "Transcript of webchat with J.K. Rowling". the-leaky-cauldron.org. 30 July 2007. Retrieved 2 April 2008. ^ "UPDATED Videos: First Harry Potter and the Deathly Hallows: Part II ABC Family preview - SnitchSeeker.com". www.snitchseeker.com. ^ Jess Cagle (5 November 2001). "The First Look At Harry". time.com. Retrieved 31 March 2008. ^ "JK Rowling interview in full". CBBC. 2 November 2001. Retrieved 29 July 2007. ^ "Anelli, Melissa, John Noe and Sue Upton. "PotterCast Interviews J.K. Rowling, part two."". Retrieved 31 March 2008. ^ a b Boucher, Geoff. "'Harry Potter': Alan Rickman looks back on decade of dark magic". Hero Complex. Los Angeles Times. Retrieved 9 June 2013. ^ a b "Alan Rickman Interviews Transcripts about Snape". ^ a b c "Alan Rickman – French Interview Translation". ^ "The movie stars we're loving right now". EW.com. Retrieved 23 March 2008. ^ Serjeant, Jill (14 July 2011). "Snape voted greatest "Potter" character in MTV poll". Reuters. ^ Fraser Mcalpine (4 August 2017). "Harry Potter Fan Film 'Severus Snape and the Marauders'". BBC America. Retrieved 4 August 2017. ^ Shawn Adler (7 December 2007). "What Would "Potter" Have Been Like With Tim Roth As Snape?". MTV. Retrieved 8 December 2007. ^ The Nerdist Podcast episode 776: "Tim Roth". 23 December 2015. ^ a b "Director 'denies' Potter audience... just a little". 13 July 2007. Retrieved 14 March 2008. ^ "Scholastic asks "Is Snape Good or Evil?"". 1 May 2007. Retrieved 18 March 2008. ^ "Severus Snape: Friend or Foe?". Retrieved 18 March 2008. Link includes video. ^ "The Great Snape Debate – Borders Exclusive". Retrieved 18 March 2008. ^ "Interview with Stephen Fry at Royal Albert Hall". 2003. Retrieved 3 September 2007. ^ Mercedes Lackey, ed. (2006). Mapping the World of Harry Potter. BenBella Books, Inc. pp. 39–52. ISBN 978-1-932100-59-4. Retrieved 30 July 2008. ^ "Missing from 'Harry Potter'". 25 July 2007. Retrieved 23 June 2008. ^ Steve Daly. "Daniel Radcliffe Talks 'Deathly Hallows'". EW.com. Retrieved 18 March 2008. ^ Jill Serjeant; Bob Tourtellotte (14 July 2011). "Snape voted greatest "Potter" character in MTV poll". Reuters. Retrieved 25 July 2011. ^ "The 25 Greatest Harry Potter Characters". Empire. ^ "Snape wins favourite Harry Potter character". Telegraph.co.uk. Retrieved 18 April 2016. ^ "PotterPuppetPals Top at YouTube Awards". the-leaky-cauldron.org. 22 March 2008. ^ "Torg Potter and the Sorcerer's Nuts". Archived from the original on 22 September 2003. Retrieved 18 July 2007.